Nine days before Christmas is going to be a very special day. A special day because Blake will be turning one! I held him in my arms for the first time. so all his presents for both his birthday and Christmas have all been brought. I wanted him to have plus I have a list on Amazon so that other family members can get ideas on what to get for him as well. something I really wanted him to have since he loves In The Night Garden (especially Iggle Piggle). But at £59.99 I felt that it was far too much to spend on a toy however Amazon have it as of writing this post down to £32.84. stored in his toy box as it folds down small and the balls also have a little case to put them in. 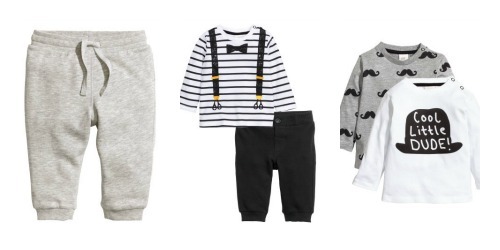 All of the clothing is from HandM's Kids range from the 4 months to 2 years boys section. I have a little thing for Monochrome at the moment and just love these pieces. This is the first lot of clothing that he owns from there and I am so impressed with prices and quality of the items I have received. We actually got Blake's second hand but it's a great condition. 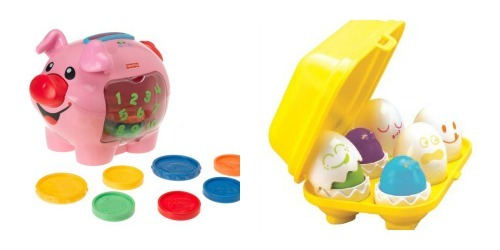 also great for fine motor skills and hand eye co-ordination. 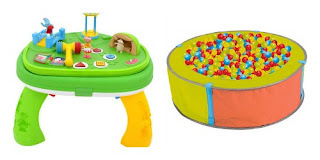 that I know Blake will love and have fun with as he loves anything that makes a noise. So that is as far as gifts go for Blake's birthday I still have some more things I need to do. I have his outfit sorted but want to find some cute shoes to go with it. I also have showed my mum a cake idea as she will be making his cake. I just need to sort out the little bits like decorations, balloons and wrapping paper. that would be great I can't seem to find any. to need some ideas for your own child, family or even friends little ones. I would love to know what you have purchased for a child's first birthday? Great choice of gifts! Wow your house is going to be full of toys by the time you get to xmas day! I am in love with the cool little dude and bow tie sweater they are so cute, Blake has got some serious swag. I never knew h&m had such great kids clothes. Those plastic eggs are a brilliant toy. N used to love them at other people's houses. oh how lovely. My daughter has just turned six and it just gets faster and faster.